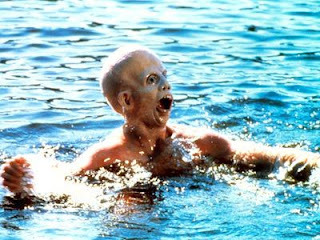 Cam's Cinematic Episodes: Epi-Cast: Episode 5 - "Jason Voorhees's Private Dancer"
Epi-Cast: Episode 5 - "Jason Voorhees's Private Dancer"
Holy smokes! After too long of a hiatus (2 measly weeks), we've found the time in our busy, busy lives to throw together another one hour and change of film-focused entertainment for you, the little people! So kick off those galoshes, pop some corn, and prepare for Tom Wytrwal and I to amuse you against your will until you just can't takes no mores. Epi-Cast: Episode 5 - "Jason Voorhees's Private Dancer." If you thought Cam and Tom's in-depth discussions on The Wrestler or Valkyrie were intense, just wait and see how hyper the two nitwits get while passionately jibbering and jabbering over the return of Jason Voorhees in the Michael Bay-produced Friday The 13th revamp. Naughty language is sure to follow. In addition, the duo of dunces get alternately angry and happy over the trailers for Transformers: Revenge of the Fallen, G.I. Joe: The Rise Of Cobra and Tarantino's Inglourious Basterds. Finally, they also find time to review Coraline, The International, The Uninvited, Babylon A.D., The Siege and... Hook. It's an episode guaranteed to make you feel like you've been lobotomized! P.S. : We are also now available on iTunes as well. Simply do a store search for "Epi-Cast" and PRESTO!, there we are! Oh, we're the film-discussion show, not the God-talk one.